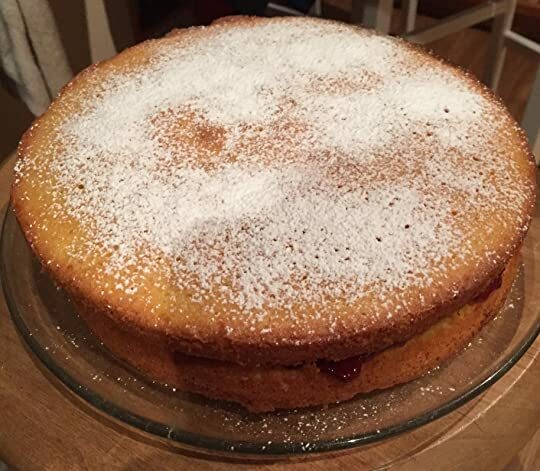 As the weather turns cooler, my poodles race around like maniacs and I start to bake. Yesterday was no exception. After a week of 80-plus degree heat, the temps finally sank to a respectable 63 degrees and I went digging for my cake pans. I made sausage rolls along with mashed potatoes and onion gravy, steamed English peas, and a Victoria sandwich for dessert. Comfort food at its best. 1373. INGREDIENTS – 1 lb. of puff-paste No. 1206, sausage-meat No. 837, the yolk of 1 egg. Mode.—Make 1 lb. of puff-paste by recipe No. 1206; roll it out to the thickness of about 1/2 inch, or rather less, and divide it into 8, 10, or 12 squares, according to the size the rolls are intended to be. Place some sausage-meat on one-half of each square, wet the edges of the paste, and fold it over the meat; slightly press the edges together, and trim them neatly with a knife. Brush the rolls over with the yolk of an egg, and bake them in a well-heated oven for about 1/2 hour, or longer should they be very large. The remains of cold chicken and ham, minced and seasoned, as also cold veal or beef, make very good rolls. Time.—1/2 hour, or longer if the rolls are large. Sufficient.—1 lb. of paste for 10 or 12 rolls. Seasonable, with sausage-meat, from September to March or April. 837. INGREDIENTS – 1 lb. of pork, fat and lean, without skin or gristle; 1 lb. of lean veal, 1 lb. of beef suet, 1/2 lb. of bread crumbs, the rind of 1/2 lemon, 1 small nutmeg, 6 sage-leaves, 1 teaspoonful of pepper, 2 teaspoonfuls of salt, 1/2 teaspoonful of savory, 1/2 teaspoonful of marjoram. 1205. INGREDIENTS – To every lb. of flour allow 1 lb. of butter, and not quite 1/2 pint of water. 1206. INGREDIENTS – To every lb. of flour allow 8 oz. of butter, 4 oz. of lard, not quite 1/2 pint of water. Preheat the oven to 400 and line a baking tray with parchment paper. Combine the dried herbs, salt and pepper, pork, Worcestershire sauce, sage and thyme. Stir, then add breadcrumbs. Mix well with your hands and set aside. Roll the pastry into a rectangle about 20 inches long and 12 inches wide (I didn’t measure, so I have no idea if this is right–just make a big rectangle). Cut in half length-wise with a knife or pizza cutter. Place the sausage on the edge of one of your rectangles and roll it up in the pastry. Brush some egg wash on to seal the edge of the pastry. 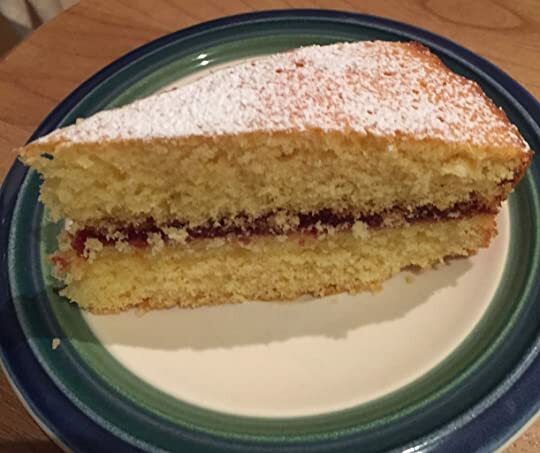 If you want it to look neat, trim any excess pastry from the end and discard. 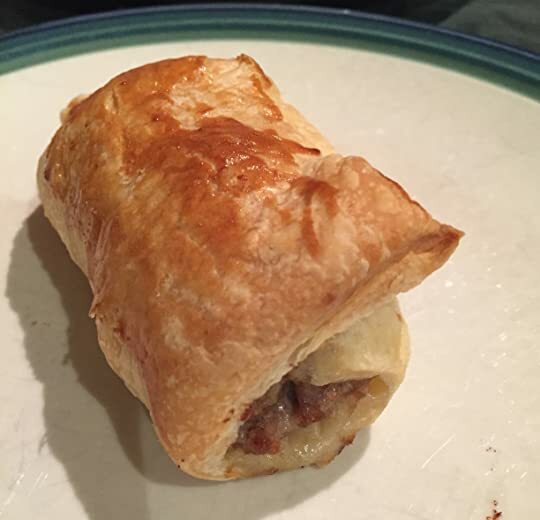 Cut the sausage roll into four (relatively) equal parts, or more if you want appetizer sized rolls. Brush the top of each roll with egg wash.
Repeat with remaining sausage and pastry. 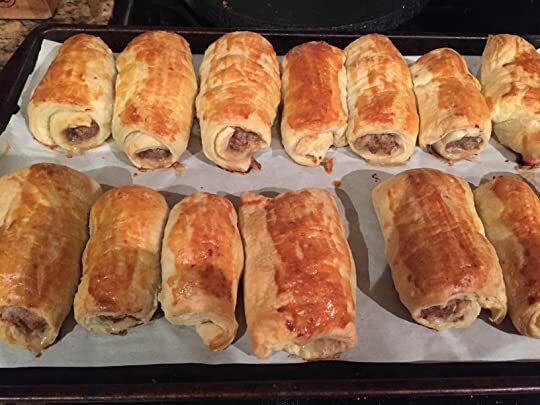 You will have extra sausage meat when you’re done (if you don’t, you made your sausages too thick), so save that for breakfast patties another day, or freeze to use in more sausage rolls later. Place the rolls on the lined baking tray. Chill for at least 30 minutes. Bake at 400 for 25-30 minutes, or until puffed and golden-brown. The original BBC recipe, which includes homemade puff, is at http://www.bbc.co.uk/food/recipes/homemade_puff_pastry_72461. Sausage rolls may be eaten hot or cold, although I prefer them hot, with a bit of mustard. They freeze well, but reheat them in the oven, wrapped in foil, not the microwave. Now if you’ll excuse me, I am rather hungry.